OAO Gazprom, together with its subsidiaries, engages in the exploration and production of oil and gas. It produces crude oil and gas condensate. The company also engages in the storage, transportation, and sale of gas; and processing of oil, gas condensate, and other hydrocarbons, as well as sale of refined products. In addition, it is involved in the generation and sale of electric and heat energy. The company serves customers in Baltic, Commonwealth of Independent States, the United States, the Asia-Pacific, and Europe, as well as exports to approximately 30 countries. Currently, the company is selling at 4.80 times earnings. This shows you that either Mr market does not believe earnings are sustainable, or that Mr Market is simply being irrational today. I purchased the stock in June 2013. I believe that Mr Market is being irrational about the company. First of all, Russia went from being touted as the next big thing during the BRIC boom which ended in 2008, to being one of the most undervalued markets in the world, as measured by P/E ratio. Currently, shares are trading at the same levels they did at the depths of the financial crisis. Some of the fears behind Russia are corruption and a perceived lack of transparency. Corruption is an issue, although it has been going on for the past 23 years. Investors who bid up Russian stocks in 2008 knew about it, but did their speculation anyway. It speaks greatly that a company like Gazprom, which is surrounded by tales of corruption, is still able to earn a very good profit every year. Based on the latest 2012 figures, the company seems to have been able to replace production with new reserves. However, the warning sign is that production of carbons has been declining since reaching a high point in 2006. 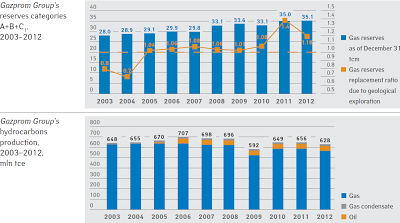 High oil and gas prices have led to rapid increases in revenues and profits over the past decade. All figures are in Russian Roubles, with $1 buying approximately 33 roubles. If you look at the earnings per share side of the equation, it looks like profits are mostly staying above 14 RUR/share. The profit of 7.31/share in 2008 was an aberration due to the financial crisis. Even if profits were to further drop to 15 RUR/share and stay there indefinitely, the stock is still undervalued at 7.50 times earnings. Gazprom owns 72% of Russian gas reserves, and supplies 70% of natural gas in the country. The problem is that Gazprom sells gas in Russia at about 3 times the amount it is selling it in Europe or the countries in the Former Soviet Union. Gazprom is also one of the largest suppliers of natural gas to the European market, with a 25% share. In recent years, the company has faced increased competition from Norway. However, given the company’s infrastructure and long-term relationships with gas providers in so many countries, it is highly unlikely that the amount of natural gas it would sell abroad simply drops precipitously. In addition, while sales in Europe have been flat, prices have been increasing, thus resulting in higher revenues. A potential opportunity for Gazprom could be selling the commodity to rapidly growing Asian economies like China. Natural gas consumption is expected to increase by 4% per year through 2030, versus 1% for Europe. Gazprom also sells not only natural gas, but generates revenues from oil, electricity generation, refining and has a vast network of transportation assets to move the commodity into the end markets. The company’s bylaws mention the requirement to distribute between 17.50% - 35% of its profit in the form of dividends to shareholders. The Russian Federation owns 50% of the entity, while 28.35% are held by ADR holders. The Russian state has an incentive to generate revenues from Gazprom, which is why it has the incentive to earn dividends from the entity. Since Gazprom is so crucial for Russian political interests, it is highly doubtful that this stake would ever be privatized. Government mismanagement could be a red flag, although total mismanagement that would result in the company’s demise would not be very helpful to the Russian government. Looking at dividend payments per share, and dividend payout ratios since 2003, it is evident that the company has managed to pay over 17.50% in the majority of the period. The notable exception is during the financial crisis, when dividends were cut steeply. Gazprom is more of a value play, rather than the typical dividend growth investment I purchase. The dividend fluctuates, and is increased or cut regularly. In addition, as non-resident of Russia, there is a 15% withholding tax on distributions. A US taxpayer can obtain a credit of the amount of foreign tax withheld using form 1116. This is why it is important to avoid holding the shares in a tax-deferred account like a Roth IRA for example. The ADR’s I purchased represent two Gazprom shares traded on the Moscow Bourse. As a result, for all per share figures used above, simply multiply by two if you are an ADR holder. 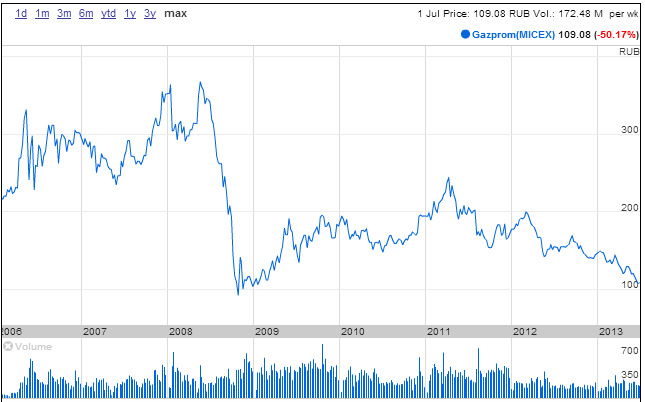 Right now Gazprom is severely undervalued at 4.80 times earnings, and yields 5.30%. The company is priced for no growth, and as if earnings per share would be decreasing going forward. In general, it is very doubtful that this would happen, given the solid relationships the company has, solid infrastructure network to transport carbons, vast reserves. In addition the company is investing in projects to find new reserves and build infrastructure to supply new markets. Last, even if the stock price continues to languish, the high dividend amount is essentially serving as a tool to unlock the value of the conglomerate.